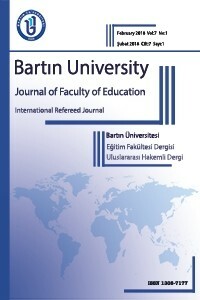 Bartın University Journal of Faculty of Education started its publication history in 2012. It is published in 3 issues; in February, June, and October. Articles submitted to the journal are reviewed in an independent, bias-free manner and under the principles of double-blinded refereeing. While the journal took under review Turkish or English articles, one as a full-text and the other as an extended abstract until the 2017 October issue, starting from the 2018 February issue, all articles are required to be submitted in both in English and Turkish. All the papers published in our journal are assigned with a Digital Object Identifier (DOI) number, the authors are not charged a fee in any of the progresses of reviewing and publishing. v Bartın University Journal of Faculty of Education has been indexed in ERIH PLUS since March 30, 2018. Click for detailed information. v To view the ULAKBİM statement on obtaining an ORCID number, please click here.